“I don’t want to go to Nicaragua,” I grumbled to my mom as I sat in the passenger’s seat, wrinkling my nose. She had just asked me if I was excited about my new Peace Corps assignment. I still wasn’t sure if I would actually go, but I said yes, for the moment. It was around New Year’s Eve 2013, the end of a taxing year for both of us. It could only go uphill from here, I reminded myself. We were driving our rental car through the surprisingly chilly New Mexican desert, a place that reminded me of Central Washington (where I grew up) because of its barren, beige-colored earth and open spaces. One thing was strikingly different: the cold, vast, cloudless, bright blue sky. “Why don’t you want to go?” asked my mom. Concerned friends – who had never been to Nicaragua – warned me that I wouldn’t be able to be myself there and that I should make the safer choice to stay in Boston. I grew up in a Mexican household, and I was never comfortable enough to come out to my mom until college. She was fine with it when I told her, but I wasn’t comfortable to do so until I had met other queer people like myself. When you finally meet other people who understand you and where you’re coming from, you become more comfortable with yourself. Hearing my queer friends’ successes and struggles with coming out to their friends and family inspired me to be more open about myself. In college, I not only met other queer women and transgender students, but most importantly to me, queer Latin@s. Leaving for Nicaragua meant losing the small network of queer Latin@s that took me so long to find, something I feared. After six months in-country, I can safely say that Nicaragua has been amazing, to say the least. I feel as if I’m in the right place at exactly the right time in my life. When I Skype with my mom and friends back home, they can’t help but comment on how relaxed I look and feel. “Man, and I thought you liked Boston but look at you now!” my friend said last night during a Skype date. I told her that being here has made me realize how happy I am while I’m living abroad. I love waking up every day and facing the challenges and successes that come with navigating a different culture. I love that each day there is something to learn, whether it’s learning to incorporate filler words like “Fijese de que…” or learning the proper way to write a cover letter in Spanish (hint: at the end, it is wise to say, “I wish you success in all of your daily activities” rather than the more American, “Thank you for your consideration”). In response to my previous concern that Nicaraguans would be a conservative, unwelcoming lot: false, false and false! While this is a highly religious country, Nicaraguans are some of the most generous, friendly people I have met. I’ve become used to the two typical questions I get asked: “Are you married?” and “Are you Catholic?” My response: no and yes. I am lucky to live in a large, relatively progressive city in the mountains, so dealing with homophobia and other –isms isn’t something I worry about as much as I would in a smaller community. There are lots of NGOs, women’s collectives, queer Latin@s and social justice work going on. I feel at home here because there’s a strong sense of people helping one another out, regardless of what they have. As a TEFL teacher trainer, my job is to co-teach high school English classes with Nicaraguan teachers. I also lead teaching workshops to other Peace Corps Volunteers and staff, and teach English classes for teachers and community members. I’ve had plenty of time to integrate into my community, cook chilaquiles, teach English, eat pastel cuatro leches and go hiking. I’m looking forward to working with Fundación Uno, which sponsors weekend English classes for Nicaraguan English teachers. Doing these trainings will be a top priority for me, since my goal is to empower Nicaraguan English teachers. They will be the ones who will stay when and if I ever leave. I can’t imagine being anywhere else at the moment, and am looking forward to overcoming life’s obstacles with more patience and optimism than ever. I’ve been lucky enough to find my queer Latin@ community in Nicaragua, and am grateful every day for it. For now, I don’t want to leave Nicaragua. 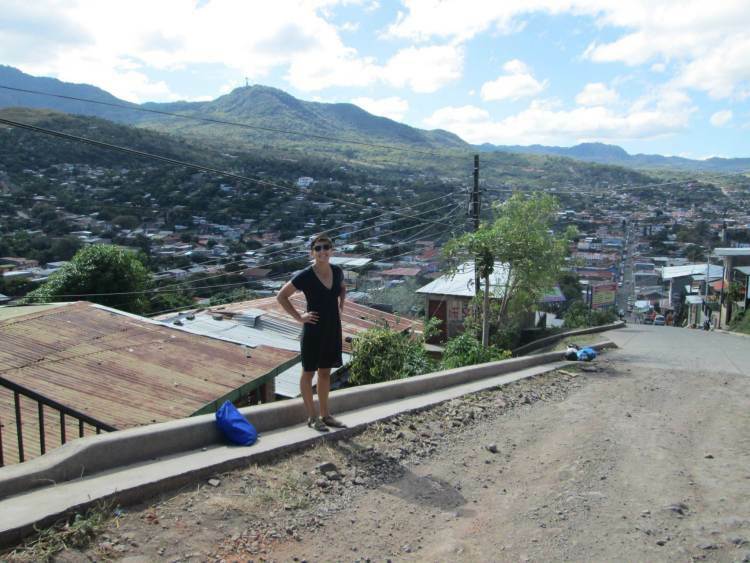 Charleen Johnson Stoever is a 24-year-old Mexican American queer woman who is serving as a TEFL Peace Corps Volunteer in Nicaragua (2014-16). She earned a B.A. in French and Women’s Studies at Wellesley College. She believes in the power of education as a tool for social mobility.